Trying to stay warm this winter? Want to give the gift of comfort and warmth to someone you love? Well then you will love some of the newest additions at Warm Buddy. Warm Buddies has created some of the cutest, cuddliest, most adorable plush heat products. Illinois winters are often very cold and one can always use a boost of warmth. In addition Warm Buddy has earned the s PTPA (Parent Tested Parent Approved) award for high quality family products. We were sent froggie frog. The softness of our newest friend Froggie is so comforting. Created using the softest plush bubble fabric and features baby safe eyes Like every Warm Buddy Plush animal Froggie Frog comes with a removable inner pack that can be warmed in the microwave or cooled in the freezer as desired. Making it the perfect gift for anyone on the list. Heat therapy products as cute as this would give comfort to anyone who has an overly stressful or hard work day. Warm Buddy plush animals such as bears, lambs and panda bears. This recipe makes 15 to 20 servings. Place the quartered potatoes into a large pot. Don't overcrowd the potatoes. You may need to use two pots if you don't have one that's big enough. Cover the potatoes with salted water, bring the water to a boil on the stove and cook at a gentle boil until the potato pieces are fork tender, about 15 minutes. Transfer the potatoes to a large bowl and mash with a hand masher until smooth, adding the milk or cream, butter, salt and pepper as you go. Be careful not to add too much milk or cream. You don't want the potatoes to be runny. Set a large serving tray (preferably not a white one) next to your bowl of mashed potatoes. Scoop the potatoes onto the tray, starting with the large, bottom "snowball." Scoop a slightly smaller amount of potatoes onto the tray above the first snowball to create the snowman's midsection. Then, add the smallest helping of potatoes on top for the head. Smooth out the potatoes with the back of a spoon. Scrape off the tips of the radishes with a potato peeler and place them scraped-side-up on the snowman's face for eyes. Insert the baby carrot for the nose and the raisins as buttons. Working in long motions, peel off two thin layers of the large carrot with your potato peeler and drape the carrot strips across the snowman's neck like a scarf. You could also snip the ends of the carrot peels with kitchen shears to make the scarf look like it has fringe. Mix popcorn, nuts, marshmallows and gum drops in large bowl. Melt butter in heavy saucepan. Add sugar, corn syrup and bring to a boil. Stirring, simmer for 3 minutes. Add vanilla extract. Blend well. Pour over popcorn. Mix, let stand 2 minutes to cool. With wet hands, shape into cane. Wrap in plastic. Store in cool place. know you can make a cheesecake that doesn't need any baking! In small bowl, combine graham cracker crumbs, 1/4 cup sugar, nutmeg, and butter; mix well. Press into bottom of 8-inch-square baking dish; set aside. In small saucepan, combine gelatin and water; stir over low heat 3 to 4 minutes, until dissolved. Remove from heat; set aside. In large bowl, with an electric beater on medium speed, beat cream cheese and the remaining 1/4 cup sugar until well blended. Stir in dissolved gelatin and eggnog until well blended. Refrigerate 8 to 10 minutes, until slightly thickened. In a medium-sized bowl, whip cream. Fold whipped cream into eggnog mixture, then pour over prepared crust, cover, and chill 3 to 4 hours before serving. For an extra-special holiday look, sprinkle the top with some additional nutmeg. cup unsalted butter, cut in 12 pieces, room temp. In small bowl mix milk and yeast and stir very well with a wisk until the yeast is dissolved in the milk. If it clumps, your milk is too cold. Let sit for 4-5 minutes. Flip the speed up to 2 and add the flour mixture ½ C. at a time. your mixture will be dry flaky, that is ok.
Change the attachment to the dough hook and start adding your butter one piece at a time. Mix this for 4-5 minutes until you get a nice big dough ball. Set ball in a large bowl and cover, and let this rise for 1 1.2 hours. Cinnamon Butter: Add all ingredients to stand mixer with flat paddle attachment and mix low-med speed until smooth. By smooth I mean ready to spread on bread, this will take 3-4 minutes. Uncover your dough and work out the air bubbles and turn the dough onto a floured surface. 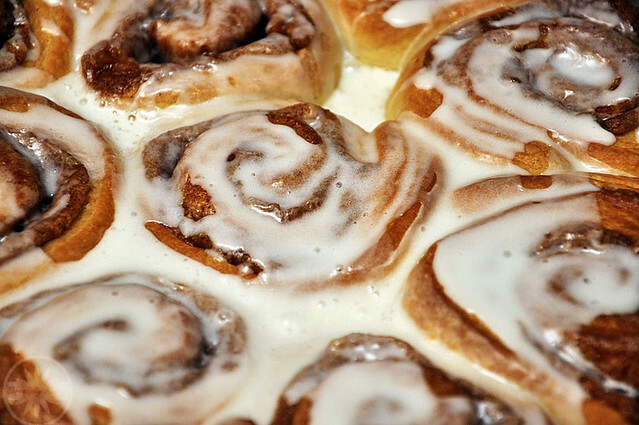 Spread cinnamon butter evenly on the dough. and yes, you can lick the spatula. Roll the dough on the long side like a jelly roll, and use a bench scraper to slice your dough. Place rolls on pan and cover with plastic wrap, let rise 1 hour. Preheat oven to 350. Bake rolls for about 35 minutes or when they are golden brown. leave in pan on cooling rack for 5 minutes. Prepare glaze by mixing the sugar and cream and then the water 2 TBS at a time to thin until it reaches icing consistency. pour on still warm rolls. Line 2 baking sheets with parchment and set aside. 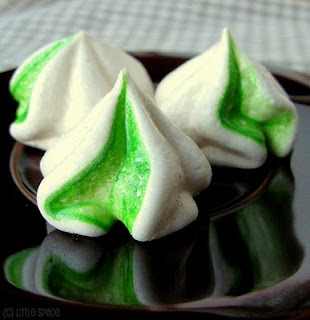 In a medium bowl, beat egg whites with cream of tartar until soft peaks form. Beat in peppermint, then sugar about 2 tablespoons at a time, until stiff glossy peaks form. Fit a pastry bag with 1/4 inch plain tip. Use a small clean paintbrush or cotton swab to brush the inside of the bag with 2 stripes of the food coloring, opposite one another. Preheat oven to 200F. Spoon meringue into pastry bag. Pipe 1 inch cookie kisses onto baking sheets, 1 inch apart. Bake until cookies are dry, about 1 1/2 hours. Turn off the oven and let cookies remain in the oven another 30 minutes. Transfer to a wire rack and let cool completely. Cookies will keep up to 1 week stored in an air tight container. Cream butter and sugar; add egg and vanilla. Blend thoroughly. Spoon and measure flour, stir in salt. Add to butter mixture and combine. Divide dough into two parts; blend red food coloring into one half until desired shade. Taking small bits of dough from each color, roll each into 4 inch strips on a lightly floured surface. Place strips alongside one another, press gently together and twist. Very important - shape cookies one at a time or dough will become too dry to twist. Place cookies on parchment lined baking sheet and curve the top of cookie down to form the handle of the candy cane. Bake approximately 9 minutes or until bottoms are just lightly browned. While still warm, remove to cooling rack and if so desired, sprinkle with sugar. Allow to cool completely. Baby Banz the protection experts can prepare you for the coldest time of year as well. 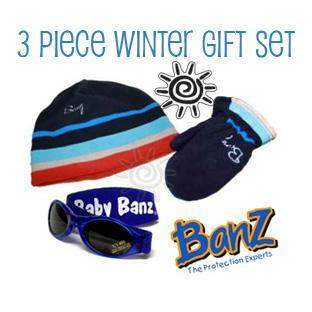 While Baby Banz offers the perfect protection products for sports like swimming and keeping you safe in the sun they also easily offer products like the Banz Winter Wear to protect your little ones in the winter as well. Baby Banz Winter Wear is here! Made from nice warm polar fleece, the Baby Banz winter range will provide great comfort and warmth for your child this season. With a selection of six great designs there will be something here for everyone. So what do you get? The protective eye wear is not sold with the Winter Wear but they are available as well. Baby Banz is a trusted name in our household. We know that when we are preparing the little ones for winter that we should keep in mind Baby Banz. You should check them out as well. Our thoughts : we believe that the winter wear from Baby Banz will function as it should. We trust products from Baby Banz. The softness of the mittens, hat and scarf are sure to please and give warmth that our little ones will need. 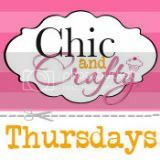 I also love the colors and styles that are sure to flatter the outer look of our little ones as well. COMBINE flour, baking soda and salt in small bowl. Beat butter, granulated sugar, brown sugar and vanilla extract in large mixer bowl until creamy. Add eggs, one at a time, beating well after each addition. Gradually beat in flour mixture. Stir in morsels, potato chips, pretzel pieces and peanuts. Drop by rounded tablespoon onto ungreased baking sheets.